The most historic winery on the Blue Ridge Whisky Wine Loop. Sharp Rock Vineyards carries on the legacy of the 18th century farm located at the base of the Shenandoah National Park’s most renowned hiking trail on Old Rag Mountain. The idyllic landscape and historic tasting room is the perfect setting for Jim and Kathy East’s charming vineyards and winery. 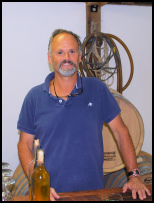 Jim, the wine maker, prides himself on producing very personal small batch artisan wines. He uses “old world” wine making techniques that produce 12 wines each year including Sauvignon Blanc, Chardonnay, Petit Verdot, Malbec, bright Roses, and Chamois blends. Sharp Rock Vineyards also hosts on-site weddings and other events and also offers lodging on the property. This treasure is open all seasons – check their website for daily hours.